Dealing with eczema is no fun for moms or kids. 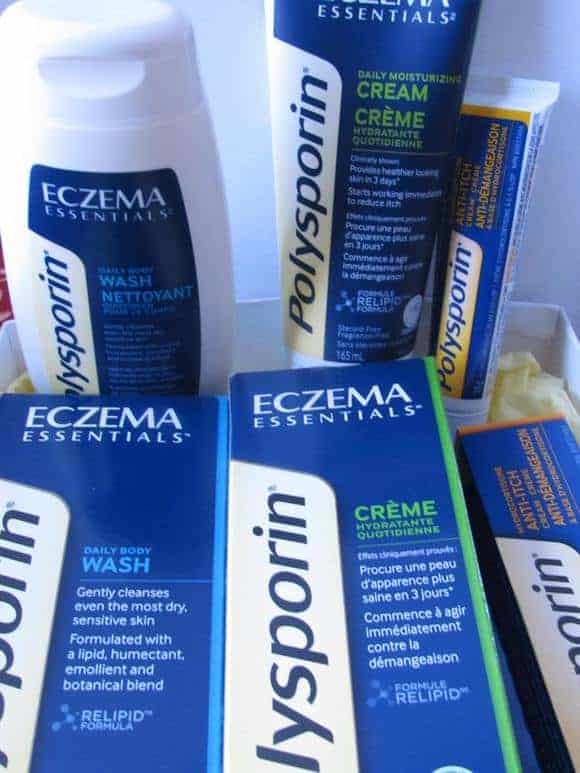 Thankfully, POLYSPORIN® Eczema EssentialsTM helps soothe those eczema symptoms as soon as they start. Just about every parent has dealt with itchy skin with their children. Many of you may have even tried to cope with eczema! It’s very uncomfortable for children and as a parent you may not know what product to use to ease it! With my daughter, eczema symptoms became a regular occurrence in her life, especially during the winter. She has a very dry skin! Each night I apply a moisturizing cream for sensitive skin as per her doctor’s recommendation. But with our cold Canadian weather and our skiing activities, her skin is put through a lot! I almost double the dosage for the cream during winter and she still gets eczema symptoms like redness and itchiness! It is frustrating because you don’t know which cream will work! Let me share a story with you. Last week, my daughter came back from school and said “mommy, my back itches” Four little words that sent me diving into action. 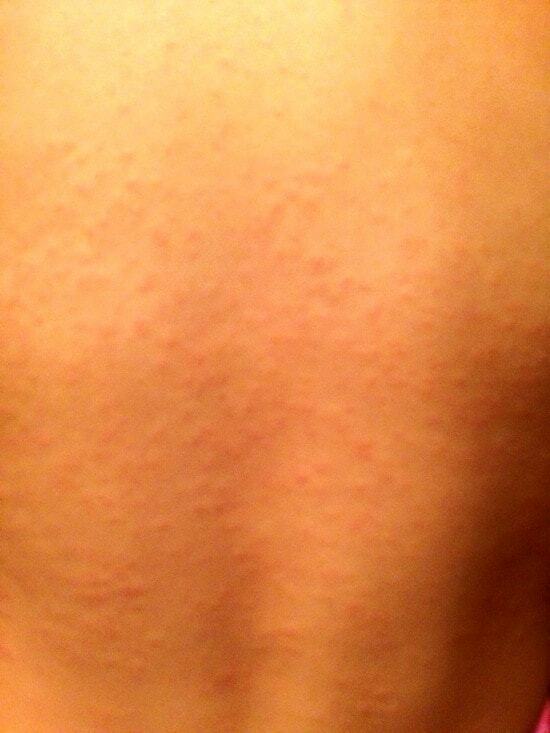 Itchiness is back! What did I DO wrong? Again? I checked on her back and it was all red! See the picture! Poor little one! She was very uncomfortable! How am I going to ease her pain? Luckily I had the POLYSPORIN® Eczema EssentialsTM Anti-Itch cream! It has an active ingredient: Hydrocortisone 0.5% and is appropriate for use for kids ages 2 and older. I was safe to use it on my daughter. As a mom I always worry about applying cream on my children unless I know it’s absolutely safe! So many creams can actually make eczema symptoms worse! I applied the cream just after a warm bath and she was feeling better. The itchiness was almost gone! It was a lifesaver for her and for me! The relief was fast! The skin looked less red too! The next morning, I applied the cream again and I took her to the doctor since the rash spread to her tummy! The doctor said there was nothing she could do. It’s an allergic reaction to something. She told me to apply the anti-itch cream. At that particular moment, I wanted just to thank POLYSPORIN from the bottom of my heart for the anti-itch cream! It was truly a lifesaver. Itchiness: I don’t want you back! What do I do to prevent the eczema symptoms from returning? While the itch disappeared in 24 hours, the rash stayed! I did not want my daughter to experience the itchiness again so I had to do something! I used the Daily wash for my daughter over her body, then applied the moisturizing cream! I did not have to use the anti-itch cream again though. 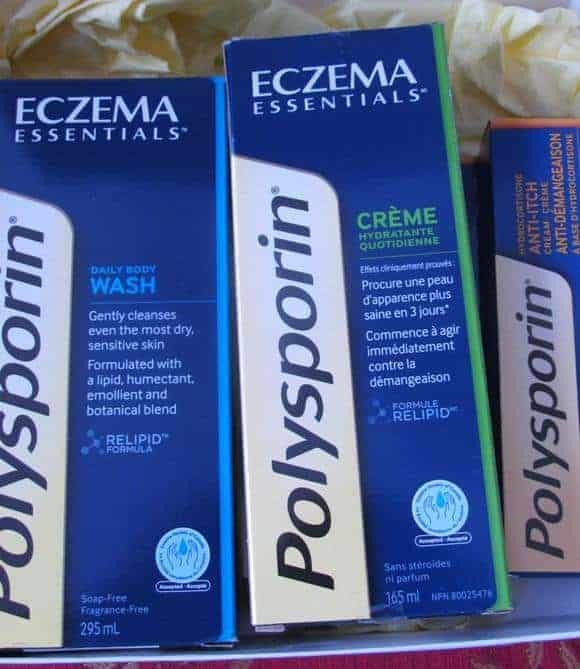 POLYSPORIN® Eczema EssentialsTM Daily wash: In order to relieve her sensitive skin and restore its health, I used the Daily wash! It is gentle and non-irritating on eczema-prone skin. Besides, it is soap and fragrance free (her pediatrician always recommends that feature, as fragrances can also agitate eczema symptoms). POLYSPORIN® Eczema EssentialsTM Moisturizing cream: After the daily wash, I used this cream to keep her skin moisturized. I find it very useful after our ski trips! I even applied it on myself and it felt so good! The cream carries the Eczema Society of Canada Seal of Approval so I felt comfortable applying it to my daughter. Besides, it has an active ingredient Colloidal oatmeal that reduces irritation and dryness. What more could I ask for? Bottom line, POLYSPORIN® Eczema EssentialsTM did a terrific job of helping to soothe my daughter’s eczema symptoms. I would highly recommend it to any parent who deals with itchy skin! What do you do when itchiness and eczema symptoms strike your children? Disclosure: I am part of the the POLYSPORIN® Eczema EssentialsTMBlogger Campaign with Mom Central Canada and I receive special perks as part of my affiliation with this group. The opinions on this blog are my own. I was just reflecting on eczema today, as two of my kids have winter eczema. I’m glad that winter is coming to an end, as it will improve with the milder weather. One of my younger brothers had problems with eczema as a child. It was so hard to see him be so uncomfortable. I remember my Mom tried all sorts of things to help it. My Daughter used to have such problems with eczema, but she changed her diet and is doing so much better. This would be great just to have in case she needs it. My daughter also has eczema and hers is so severe it leaves scars which of course, reduce me to tears because I feel like I failed her – no matter how strict our moisturizing regimen is. Awwww. Your poor daughter having to deal with that itch and annoyance 🙁 It’s a good thing you had relief ready to go! This sounds like a good product. Thank you for introducing me to this product- my son can use this. Sounds Like A Great Product My Child Had It When He Was Younger He Would Itch Like Crazy It Was Bad On His Elbows We Used Curel Glad There Is Finally A Product Out There For Our Children Hopefully Your Daughter Out Grows It In Time!!! !